The idea of a single-payer health care system for our country has floated through American politics for more than a century, and from both sides of our political spectrum. The current face of this idea is Senator Bernie Sanders, who plans to release his “Medicare for All” Bill this month with the backing of Senator Kamala Harris (D., Cal), and presumably other Democrats as the reveal approaches. The problem is not the idea; the problem is the timing. We need to fix the system we have first. Once we have a stabilized system, we need to have a robust, bipartisan debate in this country about where to go next. A Single-Payer system should be part of that conversation, but we can’t start any discussion with that (or any other idea) as a Litmus Test. So- is this the moment when drawing attention to a “Medicare for All” alternative best serves the public? I argue it is not. 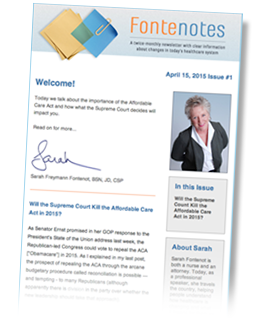 When the Affordable Care Act [ACA], commonly known as “Obamacare,” was signed in 2010 it was the culmination of decades of proposals, initiatives, political losses, and differences of opinion. As ultimately passed, the ACA includes ideas from administrations as diverse as Bill Clinton, Richard Nixon, FDR and George W. Bush (for more, see Fontenotes No 34). And now, with the failure of the GOP “Repeal & Replace” attempts earlier this year, the ACA remains the Law of the Land. But Obamacare is in bad shape, particularly at this moment as the insurance Exchanges (or “Marketplaces”) hang in the balance. Right now a bipartisan attempt in Congress to stabilize the marketplaces – specifically to pass legislation assuring the continuation of cost-sharing subsidies to the insurance companies participating in Obamacare- must be accomplished this month before those companies set premiums for 2018. (For more on the history, politics, and importance of the Subsidies, see Fontenotes #39). If that committee, led by Senator Lamar Alexander (R., Tenn.) and Senator Patty Murray (D., Wash.) succeeds, premiums on the Exchanges should come down from the catastrophic increases that floated this summer. (Senator Bernie Sanders also serves on that Committee). Significant work by individual states has now assured that there is at least one insurance company operating in every market in the country– but multiple insurers in each exchange are needed to bring competition and lowered prices. In the meantime, the ACA model depends on insuring every person (which is why it includes a mandate), so the insurance pool includes not only older and sicker people but the young and healthy as well. This is the most critical component of controlling costs. And there are questions about how the Trump-led IRS will enforce the mandate, if at all. This should come as no surprise to anyone. Not from an Administration that bragged in March that there were 1,442 ways to undermine Obamacare without needing Congressional action. Which begs the question: When President Trump said “Obamacare is going to Implode,” was that a prediction or a promise? In Summary: What we currently have is a health care system dictated by a law that was never fully implemented, is under attack by the Trump administration and has many problems both immediate and long-term. Everyone knows Obamacare needs fixing. Even President Obama. But this is the system we have. Given that health care reform is a goal that has evaded administrations on both sides of the political spectrum for the last 60 (plus) years I think we should make it work before we start all over again. Advocacy for of a Single-Payer Health Care system in this country dates to the 1880s and has reoccurred cyclically ever since. In December 2015, a Kaiser poll found a whopping 58% of Americans, across all political affiliations, favoring the idea of a single-payer health care system. The popularity of Bernie Sander’s 2016 Election platform reflected that zeal. But the idea is more nuanced than a first-glance- or a political slogan- reveals. How high do taxes need to go? Look at Bernie’s own State of Vermont. Having tried since 2005 to obtain a state Single-Payer system, with much fanfare Vermont finally passed that law in 2011. And revoked it in 2014. Before it was ever implemented. Described by Forbes as “an unmitigated failure,” the death of a single-payer system in Vermont is largely attributed to the 160% tax increase that was going to be necessary to make the system work, and the lack of political will to see that through. Am I saying a single-payer system (A.K.A. “Medicare for All”) isn’t an idea worth considering? No. What I am saying is that health care is complicated- and there are no easy answers. If we decide to move beyond Obamacare, what we will need is a fully informed, bi-partisan, respectful debate covering all options. And the possibility of a Single-Payer System should be part of the conversation. But we should also consider a hybrid idea between the ACA and a Single-Payer system which would be to include a “Medicare For All” option as one plan available in each Marketplace, a government-run plan competing with the private insurance plans. This is known as “The Public Option,” which [interestingly enough] was killed by Democrats during the final passage of the ACA. For more about that, go here. In the meantime, what we do not need is a knee-jerk rush to one extreme solution while our current system- and millions of people in that system- flounder. Right now we need to focus on the problems right in front of us. What is “Universal Care,” a “Single-Market System,” and “Socialized Medicine”? Is there a difference? I describe the differences and provide examples in Fontenotes No. 17 here.